Please Notice: Due to illness, this event will be postponed! 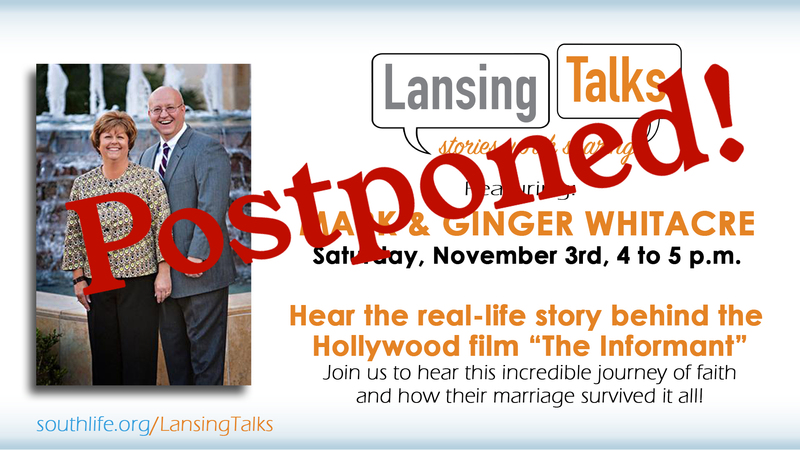 On Saturday November 3 at 4:00 pm, Mark and Ginger Whitacre (markwhitacre.com) will present the first in our series of community-oriented events called “Lansing Talks.” These are opportunities for our church and community to hear intriguing stories of unique challenges from people of faith in the public spotlight. Mark Whitacre was played by Matt Damon in the Hollywood movie “The Informant” which loosely told the story of his life before he came to Christ. As a result of participating in an international price fixing scheme with Archer Daniels Midland and embezzling 9 Million dollars, he served 9 years in prison. Hear the real-life story being the Hollywood film, ‘The Informant.’ Mark Whitacre was the highest-level corporate executive in U.S. history to become an FBI whistleblower. Mark and Ginger Whiteacre will present the first in our series of Lansing Talks: Stories worth sharing. Mark worked as an FBI informant to expose Archer Daniels Midland’s international price fixing scheme. During this time, Mark also embezzled millions, which landed him in prison for 9 years where he was mentored by Chuck Colson. Matt Damon played Mark in “the Informant” – a Hollywood movie based on this story. Please join us to hear this incredible journey of faith and how their marriage survived it all!